Hey, we won the League so we’re fully entitled to splash around in the post-game coverage for a while. I picked up a bit of this in the usual day-after-the-game piece yesterday morning but more has sprouted up since so here’s a few more links that you might be interested in. This week’s edition of the Mayo News, replete with twelve pages on the big game (one page for each NFL title we now hold, I assume? ), is the go-to destination if you simply want to pig out on coverage about Sunday. The best way to do this, needless to say, is to buy the paper in print or digital format. There’s oodles in there, such as the match report and post-game reaction pieces by Mike Finnerty, Billy Joe Padden’s tactics column (here), Edwin McGreal’s match overview, Michael Commins’ On the Road feature, Colin Sheridan’s following-the-match-from-afar feature (here) and Seán Rice’s column. Hell, I’m even in there myself this week – I’ll post this short piece separately later on. Billy Joe was also in flying form talking about the game on NewsTalk’s Off the Ball Show yesterday. You can find that here. Colm Keys’ piece in the Irish Independent has already got an airing in the comments. If you haven’t yet read it, you’ll find it here. 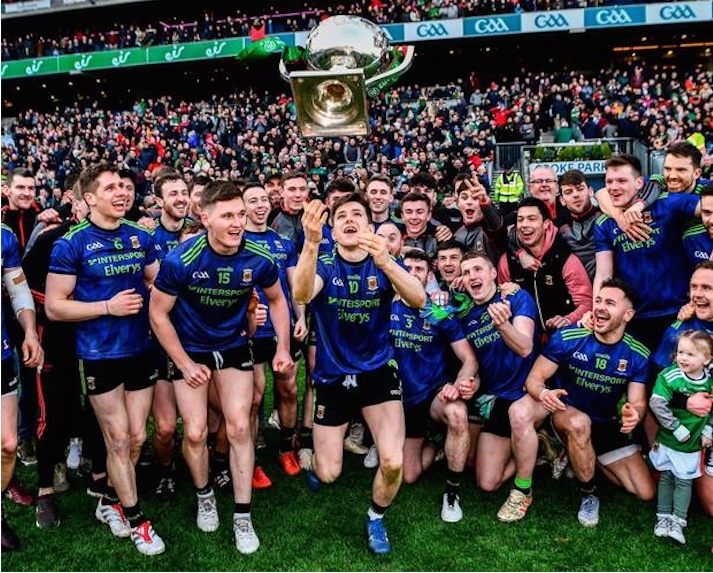 There’s more stuff about us in the Indo as well – Donnchadh Boyle on Andy Moran, Colm Keys (again) with his Team of the League, which features five of our lads (here) and Frank Roche musing about what kind of momentum the League win might give us this summer (here). Over at the Irish Examiner, meanwhile, John Fogarty has an interview piece with Andy Moran (here), while Mike Quirke’s column (here) is also worth a look. Michael Corry on Pundit Arena has a good analysis piece on Mattie Ruane and Aidan O’Shea – that’s here. The 42 also have a similarly in-depth feature piece (which, like that other article linked above, makes good use of video clips) on our all-Breaffy midfield pairing (here). The 42 have an interview piece with Andy Moran as well (here). That’ll keep you all going for a while. Time to watch the match again, maybe? Seriously! Well, we’re 3rd on the league roll of honour…and I wonder we’re Dublin regarded as small when it took them 16 years to win the AI in 2011? One word of caution from the weekend was our profligacy in front of goal. The fact we won the match should not obscure this point. There were a lot of missed chances including balls into the keeper’s hands and questionable attempts at points in the dying minutes. Hopefully this gets ironed out in the summer because Galway match will be 50/50. Let me put it another way- let’s say we lost the match! What would be our complaints? Answer: not converting our possessions into scores. It’s getting ridiculous that there’s no word about tickets for the NY game – what’s going to happen? Has anyone heard anything about tickets for the game in new york? With all the talk of how many people are heading over to it, a bit of clarity on how tickets are going to be sold for the game is badly needed. All I know, Mayo1990, is get in line early with me. Introduce yourself. We’ll have plenty of time to chat! Another article here by Kieran Shannon. I do like the examiner for their sports writing – no agendas, no snide, sneering put downs from poor enough writers-come-celebrity, just proper journalism. Also their writing is geared towards and written for Adults, or at least people with a reading ability that is greater than that of your average 8 year old child, which is more than I can say for anything that comes from Talbot street. I missed the game on Sunday. Stupid day to get a throat infection! I too was close to tears and have great admiration for our might men in blue! and the win was a case of getting the monkey off our back but we must concentrate on the performance as well as the result. We were very sloppy in the first half with poor shot selection , losing possession and leaving our centre open to numerous goal chances. Whilst our midfield was more than dominant the question must be asked how much of this was Kerry’s lack of quality. Likewise Kerry players like JOD and Walsh did not look like quality opposition. They may do so again but they were off their game on Sunday. As Horan stated there is much scope for improvement and the players will presumably be grounded in their thoughts on the game. Good things were the number of scorers, the extra competition in midfield and in the forwards and Keegan, Higgins, Harry and Barretts display of dogged determination and dare I say high level of aggression. Whatever happens we will be there right throughout the summer and again next January when the FBD rolls around again. 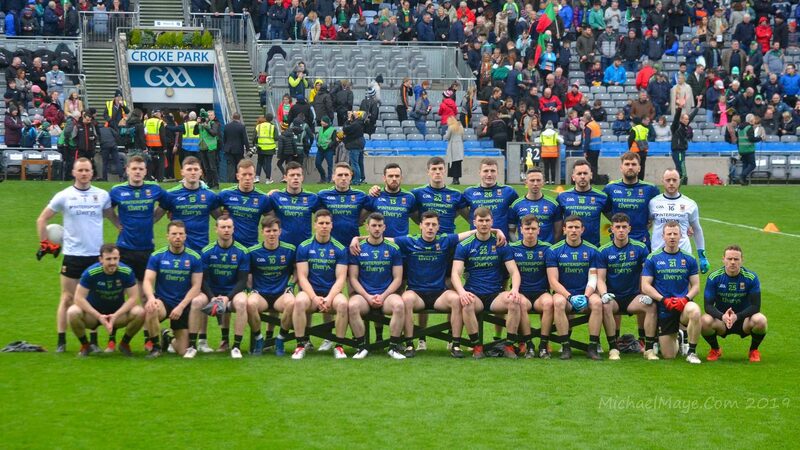 There is so much talk about Mayo how they were squandering scoring chances by kicking the ball into the Kerry goalies hands in the second half , didn’t Kerry do the same in the first half by kicking the ball into our goalies hands Any word of tickets for the Mayo v New York game in May? Has anyone noticed how quiet Martin Breheny has been this week?